It was hard to get a good shot of this fountain because clueless cell phone addicts or pipelettes (chatterboxes) kept walking into my shot. 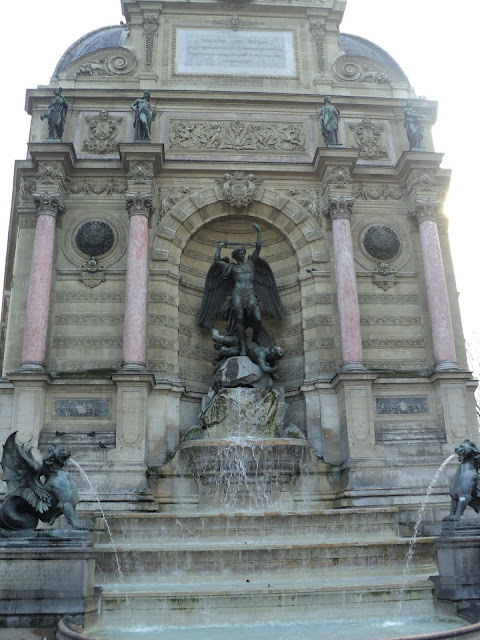 This is the St. Michel Fountain, in the heart of the Latin Quarter. My husband suggested we meet here, as many people do when visiting the city, since it's an important landmark. It was erected in 1860 during the reign of Napoleon the Third, and was created by the French sculptor Davioud in 1860. Saint Michel, protector of France, is seen here slaying a dragon.